A team at the University of Maryland received a $90,000 award from the US National Eye Institute (NEI) for its proposal to create a living model of the human retina from stem cells. The NEI’s 3-D Retina Organoid Challenge (3-D ROC), an initiative seeking to design human retinas from stem cells, received 13 submissions. Erin Lavik, ScD, a professor in the department of chemical, biochemical, and environmental engineering at the university, led the winning team. They proposed building a retina by screen-printing layers of different types of adult neural progenitor–derived retinal neurons to mimic the structure of the retina. Their system would be scalable, efficient, and reproducible, and would enable high-throughput screening for drug testing, according to a press release from the NEI. Four other US teams and one from Germany won honorable mentions in what the NEI nicknamed its “Retina in a Dish” challenge. The NEI plans to launch a second phase of the 3-D ROC in the fall, with a combined total of $1 million to be awarded to teams that can demonstrate the functionality of a retina organoid prototype. In interim 6-month follow-up results, the Intelligent Retinal Implant System II (IRIS II, Pixium Vision) improved the visual performance of implanted patients and demonstrated a favorable safety profile, according the device’s developer. However, it also displayed a shorter-than-expected lifespan in these patients. The lifespan issue presents no risks to implanted patients, the company stated, as the device is designed to be exchangeable. One replacement has already been performed in the course of the study. Nevertheless, Pixium is temporarily halting implantations in order to validate its corrective measures with regulatory bodies. A revision of the surgical technique has been identified as a potential solution, the company said. The IRIS II epiretinal device has received the European CE Mark for treatment of patients with outer retinal degeneration, including retinitis pigmentosa. These interim 6-month results were presented in September at the Eye and the Chip Conference in Detroit. Ophthotech announced the initiation of an open-label phase 2 clinical trial of its complement factor C5 inhibitor, avacincaptad pegol (Zimura) in patients with wet age-related macular degeneration (AMD). The agent will be administered in combination with ranibizumab (Lucentis, Genentech) in patients who have not been previously treated with an anti-VEGF drug. A range of avacincaptad pegol dosing regimens will be assessed. The BCVA in eyes treated with brolucizumab (RTH258, Alcon) appeared comparable to that in eyes treated with aflibercept (Eylea, Regeneron), a phase 2 study recently published in Ophthalmology concluded. Brolucizumab-treated eyes also had more stable central subfield thickness reduction, required fewer unscheduled treatments, and had higher rates of fluid resolution than their counterparts. Additionally, the safety profile of brolucizumab was similar to aflibercept over 56 weeks of treatment. The primary endpoint was not met in Spectri, the first of two phase 3 studies evaluating the safety and efficacy of lampalizumab for the treatment of geographic atrophy (GA) due to AMD, according to a press release issued by Genentech. Lampalizumab did not reduce mean change in GA lesion area compared to sham treatment at 1 year. Further dosing in patients will be interrupted until results from the second phase 3 study are evaluated. The German instrument manufacturer Oculus Optikgeräte GmbH announced that its US subsidiary Oculus Surgical has acquired Insight Instruments, a company that specialized in visualization instruments for vitreoretinal surgery. The purchase will include all the manufacturing capability of Insight, according to a press release from the German parent company. Carl Zeiss Meditec announced the US launch of a high-definition ultra-widefield fundus imaging system, the Clarus 500, in September. The device is “the first fundus camera that combines true color with high-resolution clarity down to 7 µm in an ultra-widefield view from the macula to the far periphery,” the company said in a press release. A phase 1/2 trial of a tyrosine kinase inhibitor (TKI) has begun in patients with AMD, the drug’s developer announced. Graybug Vision said its two-part ADAGIO trial will include patients with wet AMD who have been treated with anti-VEGF therapy. Patients will be switched over to its drug GB-102, an intravitreal depot formulation of sunitinib maleate, a TKI that blocks multiple angiogenesis pathways. The first phase of this multicenter trial will assess the safety of a single injection of up to four dose levels of GB-102, administered in ascending dosing cohorts. The second phase will be a randomized, double-masked safety and efficacy study comparing the TKI with standard intravitreal injection of aflibercept. A topically applied inhibitor of integrin αvΒ3 was safe and showed preliminary signs of efficacy in patients with diabetic macular edema (DME) in a phase 1/2 trial, according to the drug’s developer. Sci Fluor Life Sciences said that its drug candidate, SF0166, achieved the primary safety outcome of the trial, with no drug-related serious adverse events during the 28-day course of treatment and subsequent 28-day follow-up period. Ocular events occurred in six of the 40 evaluable patients in the trial, all mild, and one possibly drug-related. The company plans to proceed with a phase 2 trial of SF0166 in patients with DME. Results from a phase 1/2 trial of the same drug candidate in patients with AMD are pending. Second Sight Medical Products received conditional approval from the US Food and Drug Administration (FDA) to begin a feasibility study of the Orion Cortical Visual Prosthesis System. The approval allows two US sites to enroll up to five total patients. The FDA has also requested that the company conduct additional device testing and address outstanding questions. Second Sight has 45 days to respond to the FDA’s requests. First-in-human clinical studies with the Orion are planned in 2017. Like Second Sight’s Argus II, the idea behind Orion is to convert images captured by a miniature video camera mounted on the patient’s glasses into a series of small electrical pulses. Orion is designed to transmit those electrical pulses wirelessly to an array of electrodes implanted on the surface of the visual cortex, intended to result in the perception of patterns of light. By bypassing the retina and optic nerve and directly stimulating the visual cortex, the cortical prosthesis system has the potential to restore useful vision to patients who are completely blinded for many reasons, including glaucoma, diabetic retinopathy, cancer, and trauma, according to the company. ThromboGenics has introduced an “already diluted” formulation of its product ocriplasmin (Jetrea) to the US market. This formulation eliminates the need for dilution before injection. At the point of administration, the strength, potency, composition, and pharmaceutical properties of the diluted formulation are identical to those of the standard formulation after dilution, according to a press release from the company. In other news, the company announced that it has reacquired the full global rights to ocriplasmin from Alcon, a Novartis subsidiary, “based on a mutual agreement that the unique characteristics of Jetrea make ThromboGenics a better fit for building a sustainable long-term business.” Under the terms of the agreement, ThromboGenics received a cash payment of €53.7 million and a forthcoming Novartis equity investment of €10 million in ThromboGenics capital, according to the Belgian company. 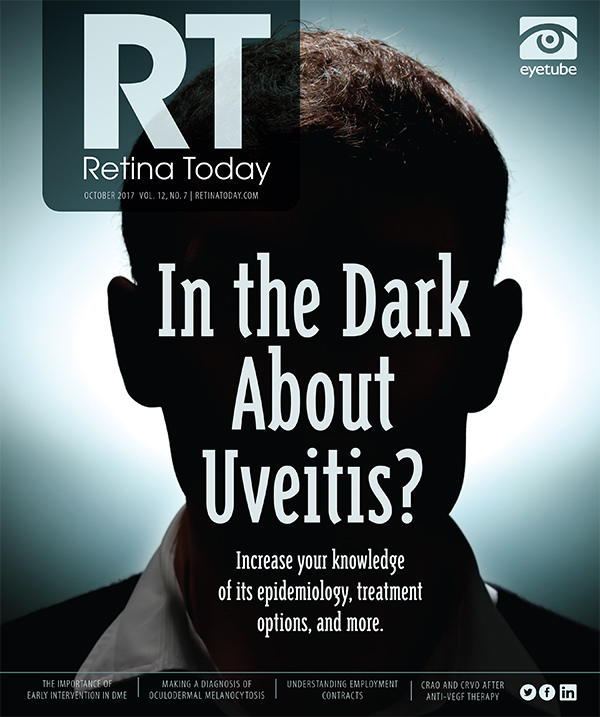 Top stories from other areas of eye care. Rayner’s RayOne Trifocal preloaded intraocular lens was unveiled at the 2017 ESCRS annual meeting in Lisbon earlier this month, and the product became available after the meeting in all markets that participate in the CE Mark. The haptic design of the lens is based on Rayner’s closed-loop platform, and the diffractive technology of the RayOne Trifocal is the result of development in partnership with a leading European research center using advanced vision simulation technology. The new patented diffractive trifocal profile reduces light loss to 11% and provides a smooth transition from near to intermediate to distance vision, according to Rayner. Researchers have developed a minimally invasive procedure to replace damaged corneal nerves with donor nerve fibers to restore feeling in the cornea and halt progressive eye damage caused by neurotrophic keratopathy, according to a press release from Duke University. Initial surgeries have been successful, and a clinical trial will soon begin. Aerie Pharmaceuticals announced the commencement of patient dosing in Mercury 3, the company’s European phase 3 clinical trial of netarsudil/latanoprost ophthalmic solution 0.02%/0.005% (Roclatan), a novel once-daily eye drop that, in US trials, has demonstrated the ability to lower intraocular pressure in patients with open-angle glaucoma or ocular hypertension. The company estimates enrollment of approximately 500 patients in Mercury 3, a two-arm, 6-month safety trial that will also provide a 90-day interim efficacy readout comparing its drug for noninferiority to bimatoprost 0.03%/timolol 0.5% ophthalmic solution (Ganfort, Allergan). Aerie expects to have top line 90-day efficacy data for the trial by early 2019. On August 14, 2017, the FDA received an adverse event report about a patient diagnosed postoperatively with bilateral hemorrhagic occlusive retinal vasculitis (HORV) after receiving injections of a triamcinolone/moxifloxacin/vancomycin formulation, compounded by Imprimis Pharmaceuticals, in each eye after cataract surgery. As a result, on September 28, 2017, the FDA approved a supplemental new drug application that adds a subsection about HORV to the Warnings section in the labeling of Vancomycin injection, USP (Baxter Healthcare).